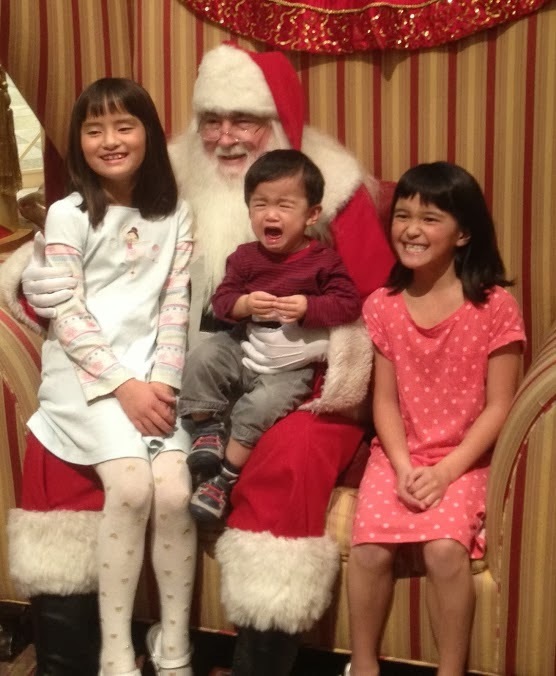 The life and times of the Lim family. The great thing about California is the ability to enjoy the outdoors and all it offers. I'm determined to give the girls an appreciation for nature. Last weekend, we took the girls up to Tahoe, where they got to see it snow for the first time. Today, I took the girls on their first hike to the Edgewood County Park in San Mateo County. The girls said they had a good time because, "We got to play with sticks and get dirty!" Katherine even did a full-on belly flop into some mud by mistake. Rather than cry, she shook it off and kept on hiking. I was very proud of her! The girls made a snowman. Hanging out in front of the cabin. Checking the trail map with their sticks. Mountain fever made them silly! Change happens in small steps. Last night as we were watching Barack Obama's victory speech, the girls stopped playing "Candy Land" long enough to look up at the T.V. Caroline: "Daddy, what's he doing?" Me: "He's giving a speech." Me: "That's going to be our next President of the United States." Caroline: "Oh. He looks nice." It occurred to be at that moment that Katherine and Caroline will grow up in a world where it's is NOT a big deal to have a person of color as President of the United States. That thought made me very, very happy. At their Halloween parade at daycare, one of the other fathers showed up dressed as Darth Vader. The girls have never seen Star Wars, and didn't know who Darth Vader was. But something about the mask impressed them, because all week they've been walking around the house saying, "Thank you, Darth Vader!" in low, growling voices. All children must be born with a gene that instinctively teaches them how to dump out their bucket of Halloween candy and sort it into little piles. We work hard for our candy in the Lim household. Even all the free candy tonight didn't sway Katherine's opinion that Halloween means a LOT of walking. Katherine: "Can you pick me up?" Me: "No, honey. If you want to get the candy, you have to walk up to the door." Katherine: "Is Halloween done yet? I'm tired." Last weekend I went into Radio Shack to buy a watch battery. The girls came in the store with me. The store was empty, and quiet. The man working at the register was a "bit" large. The girls looked at him, turned to me, and shouted, "He's gonna have a baby!" I was shocked that he still sold me the battery. Sing along if you like. We took the old Pack 'N Play crib out of storage last week to lend it out. The girls of course had no memory of the Pack 'N Play, but enjoyed playing with it nonetheless. Watching the girls climb in and out of the crib with general ease made me realize with shock and horror just how quickly our "babies" are growing up. 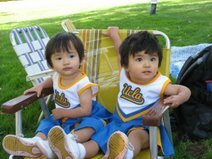 I sifted through my photos of the girls and found a photo from January 15, 2006 (5 months old) to compare and contract with the current photo taken August 20, 2008 (36 months old). 1. The Pack 'N Play is exactly the same size. 2. Big Bird is the same guy in both photos. January 15, 1006 - 5 Months Old. August 20, 2008 - 36 Months Old. Click on either photo for a larger view. Two nights ago, Caroline started crying and screaming. I went into her room, and she was sitting up in bed, eyes closed, screaming, "Don't take my macaroni!" When I tried to pick her up to sooth her, she began hitting me (eyes still closed), crying, "I want my macaroni! I want my macaroni!" Caroline LOVES to eat. Even though she is smaller than Katherine, she packs down her food at almost every meal. That evening for dinner, she had polished off a big bowl of Kraft mac 'n cheese, so I wasn't convinced she was hungry. During waking hours, Caroline never refers to it as "macaroni". We all refer to it as "mac 'n cheese". For bedtime, Caroline had read the book, "Yankee Doodle", which of course, uses the word "macaroni". So even though I was fairly certain Caroline was not talking about mac 'n cheese, we nonetheless heated up a bowl of mac 'n cheese. Caroline ate one bite, then promptly climbed back into bed and fell asleep. I'm not sure she ever fully woke up. I guess we'll never know, but I wonder what Caroline was dreaming about. Yankee Doodle? A big bowl of mac 'n cheese? Daddy witholding food from her? It's a mystery! A sure fire way to get her to eat her dinner is to tell her, "No snack until you finish your dinner." Cookies, crackers, jello, ice cream. There isn't a snack Katherine hasn't tried that she hasn't liked. While Katherine certainly has a taste for snacks, it wasn't until tonight that I realized she also has a nose for it. Tonight I had just put the girls to bed. I came outside and grabbed an oreo off the counter. I had taken ONE bite, and only ONE bite. Suddenly, Katherine started crying. I swallowed my bite of cookie and went back inside the girls' room. Katherine wanted to say good night to me once more. So I let her say good night to me, then I bent over and kissed her on the cheek. Katherine stopped crying and her head snapped up at me. How in the world did she smell ONE bite of cookie? The girls is a blood-hound for snacks. Katherine enjoying some ice cream! I am so proud of my girls. This weekend we took the girls to Children's Fairyland for a birthday party. There was a kid-sized ferris wheel that the girls really wanted to ride. But they were a bit hesitant because it was their first "big" ride where they would have to ride without Mommy or Daddy. But the great thing about having a twin sister is that you always have someone to help you be brave. When they held hands, I was so proud of them! The girls have been in their own beds for a while now, but still have needed one of the parents to stay in the room until they fall asleep. Until tonight. As I write, the girls are alone in their room, talking to one another . . . quietly. They let Daddy leave the room while they held their books. They've been talking quietly together for the past five minutes, but they have not cried for us or gotten out of bed. Five minutes later. They are asleep! When I think about how many more wonderful nights they are going to have talking sister-to-sister before they drift off to sleep, it makes me smile. Plus, now I can watch Sportscenter! Things I am thankful for. When the girls fight on the way home from daycare over a teddy bear, crying and screaming at each other and tugging on the poor bear, I am thankful . . . for beer. Yesterday we went to not one, but TWO different birthday parties for the girls. The girls got goodie bags at each party. We made the mistake of letting them hold them on the way home, even though they did not get to eat anything in the goodie bags. Dinnertime was horrible. Caroline refused to eat and kept clutching her goodie bag. The girls really understand the concept of candy now! Finally, I had to lay down the law and take the goodie bags away until the girls finished their dinner. If you had been in our house while I pried the goody bag out of Caroline's hand, you would have thought I was beating her with a stick! Even then she didn't eat until I threatened her with bath and bedtime. Lesson learned: No one gets to hold the goodie bag until after dinner. On an upside, we had a wonderful time at the parties. Looking at the photo below, can you tell which of the girls should NOT take an 8:00 am class when she gets to college? Some people are morning people, some are not. It is like this almost every morning. Katherine is the bluebird of happiness, Caroline the grumpy old man. 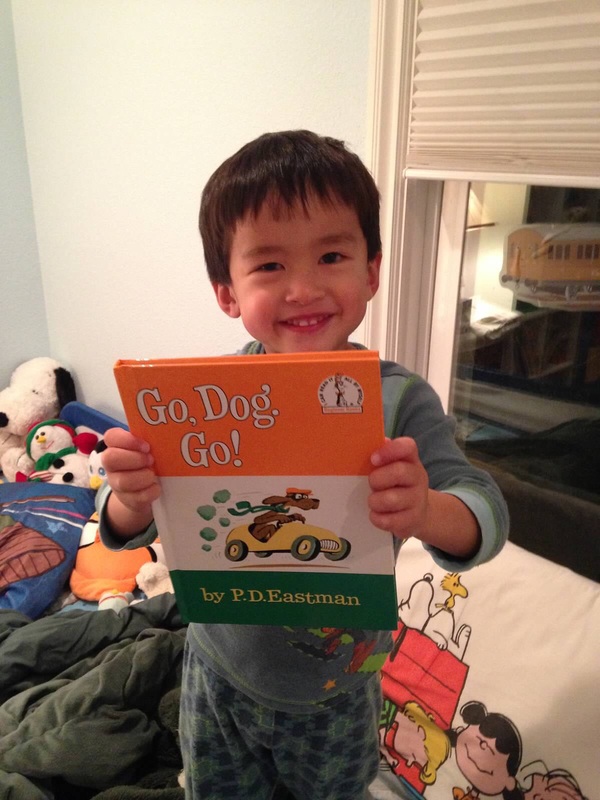 The battle in the Lim household against refined sugar officially ended on April 20, 2008. We'd done a pretty good job for 2 years, 8 months of keeping the girls away from sugary cakes, cookies and candies. However, today the girls ate birthday cake and for the first time actually seemed to enjoy it. They finished off the party with a huge Rice Krispie square. What made it even worse is that Katherine followed the cake around for a good five minutes before the candles were even lit, waiting for her piece of cake. Katherine enjoying her cake with frosting. Caroline wouldn't look up at me because she was afraid I would take the cake away! Devouring a Rice Krispie treat on the way home. The effects of a sugar high. Who knew 24 hour pharmacies were hot spots? Last night around 9:00 p.m. Caroline was starting to wheeze and cough from a cold she caught over the weekend. Turns out it was a minor asthma attack brought on by the cold. She is fine now, but I spent the better part of three hours with her in the emergency room, just to make sure. By the time I got Caroline home and back into bed, it was close to 2:00 a.m., and I needed to have her prescription filled so that she could take her medicine first thing in the morning. Terri found a 24-hour Walgreens near our house, and so at 2:05 am, I set out to fill Caroline's prescription. I expected to find the Walgreens staffed by a single cashier, sitting on a stool behind the register of an empty, semi-lit store, reading a frayed copy of People magazine. Instead, when I walked into the store, I was greeted by the blast of rock music blaring from a radio. Up and down each isle, stock workers were busy stocking shelves, each singing their version of the rock song in Tagalog. It was a like American Idol in the Twilight Zone! There were actually two or three customers shopping in the store. And I'm not talking about people in their pajamas picking up a bottle of milk or diapers. One woman was pushing a cart going aisle by aisle as she scanned a list coupons held in her hand. Who knew that Walgreens was a hot spot for Tagalog karaoke and all-night marathon shopping? So this weekend we were in Southern California for a wedding. We drove down Interstate 5. We stopped in Los Banos, about 130 miles south of San Francisco, and stopped in a truck stop to let the girls run around (Yes, a truck stop. I realize it's not the best place to take a toddler for a break, but on the I-5, you take your breaks where you can find them.). "ANDY CAPP CHEDDAR FRIES!! On sale now! $0.79." Andy Capp was featured prominently on the front page of the L.A. Times Sunday comics sections throughout the 70's and 80's, my formative Sunday-comics-reading stage. Andy Capp was featured along with "Peanuts" on the front page of the L.A. Times comic section, so I figured any comic that shared the front page with "Peanuts" had to be funny, right? I read Andy Capp faithfully for over 15 years with the above reasoning in mind. In over 15 years of reading Andy Capp, it was NEVER FUNNY. Ever. Most of the jokes had to do with Andy being lazy on the couch, or making fun of his wife. Or he would be at a bar and end up chasing someone angrily out of the bar. Occasionally he would play soccer, but being English, Andy Capp called it "football." That gag usually had Andy chasing someone around angrily for no good reason. Somtimes Andy would hit on some attractive girls, and then the gag would end with his wife chasing him around angrily. Like I said -- NEVER funny. Did I mention, "EVER"? Andy Capp - Not funny. So I hear I am in Los Banos, watching my kids with one eye, while my other eye is fixated on this ad for Andy Capp Cheddar Fries. I wondered, "Did I miss something in all those years of reading Andy Capp comics? Somebody must think that comic is funny or they wouldn't give him his own bag of chips, would they?" And why in the hell was I seeing these chips for the first time in Los Banos? Of course, I had to buy a bag. I plunked down my $0.79 and was rewarded with a bag of potato and corn sticks sprinkled liberally with orange cheddar-flavoring. Driving while eating greasy "cheddar fries" is hard, because it makes the wheel slick. 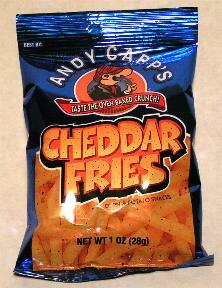 Andy Capp Cheddar Fries are about as tasty as the Andy Capp comic strip was funny. Caroline reading in the car. You probably know that on Christmas Day 2007, a tiger escaped from the San Francisco Zoo, killing one person. As members of the Zoo, we went back there about a week before the big cat exhibits were scheduled to reopen. All the newspapers said that the tiger exhibits were closed. Signs at the zoo said, "All big cats will not be on display until improved safety measures are put into place." Um, correct me if I'm wrong, but isn't the creature I photographed above a . . . TIGER? The same type of tiger that attacked and killed someone on Christmas Day? The same tiger that the signs around the Zoo said "Were off exhibit for your safety and theirs"? The tiger was about 12 feet from me, separated only by a thin wire mesh fence. Other than good common sense, there was nothing to prohibit me from sticking my hand through the cage. A zoo employee who was standing nearby merely commented, "Aren't they magnificent?" To which I wanted to ask her, "What do you mean, 'they'? Isn't this the last one left after the other one got shot?" But good manners stopped me from making scene. With Grandma checking out a big owl. Everyone is looking at the camera and smiling. A miracle! If I have any doubt that Caroline is my daughter, all I need to do is wake her up every morning. It is safe to say that I am NOT a morning person. Caroline is exactly like me in this regard. When I go into the girls' room to wake them up to get ready for school, Caroline will look up at me, then quickly roll over onto her stomach in the classic, "If I pretend I didn't see him, maybe he'll pretend not to see me." If you try to say "Good morning!" to Caroline, she will quickly tell you, "No! Be quiet!" Trying to sing to her to raise her spirits is like poking a bear with a stick. A bear that has just woken up from her winter's hiberation, I might add. When you pick her up to change her diaper (or have her sit on the toilet, as we begin potty training her), she screams bloody murder. If CPS were in the house at that very moment, they would probably take her from us just on the volume of her cries. It is not until about 10-15 minutes have passed that Caroline will fully wake up and begin to interact. And it is only after she's had some milk or some cereal that she will feel ready to smile and give you a hug. I hope she never has to take an 8:00 am class in college. I would fear for her roomates. Today is a rainy, windy day, so after church I took the girls to the local mall to run around. The girls love to eat at the food court, so after checking out the patio furniture at Sears (much more entertaining for the girls than toys! ), we headed over to the food court. Feeding the girls has become so much easier now that they are 2 1/2 years old. No more packing bowls, utensils, or special cups. They can sit in adult chairs and eat with paper plates, plastic utensils, and love love love to have their own "adult" cups of water. Today I ordered a Hot Dog On a Stick for Katherine, and a chicken burrito for myself and Caroline to share. Katherine promptly gnawed about three bites of cornbread off the hot dog on a stick before proclaiming, "I don't like it." Katherine then proceeded to eat 1/2 of my burrito, but only the tortilla. Caroline picked apart her 1/4 of the burrito to eat all the black beans and tortilla, and left the rice, chicken, and cheese in small heaps on her paper plate. The Hot Dog On a Stick cost me $2.75. The burrito set me back another $5.99, of which I ate 1/2. For about $1.00 I could have fed the girls a can of black beans and Mission brand tortillas from home! She thinks it's a good smile. I don't have the heart to tell her how silly it looks. Our photo & video archives are password protected. Login as "guest". Password is David's hometown (one word). C'est La Me - Amy in Paris!